Earlier this year, multiple people asked me if I would be attending a bullfight while in Spain. "Of course not!" I'd say, vehemently against the barbaric killing of animals for sport. 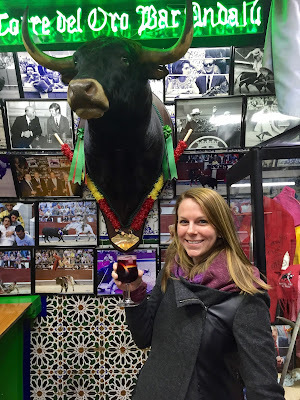 So color me surprised when I fell in love with La Torre del Oro, a bullfighting bar in Plaza Mayor, Madrid. This bar did not have live bullfights at the bar, as that would have been muy peligroso, but was rather a place where people who love bullfights could gather. I fell in love with this bar so much that my family and I visited on three separate occasions over the three days we were in Madrid. We even took our Flytographer photographer inside for a few minutes of our family photoshoot, before I got the hang of looking natural in front of the camera. It certainly helped that our hotel was right off of Plaza Mayor and that it rained the entire weekend, so we were frequently looking for shelter. While the bar was indeed convenient for us, the joy I felt in there was due to the overwhelming feeling when inside that this place could only exist in Madrid. Every inch of the walls are covered in bullfighting paraphernalia - including photos, capes, and bull heads. In that way, it reminded me of McSorley's, if McSorley's had a central theme. It also reminded me of McSorley's because of the immediate feeling that I belonged. The bartenders are friendly and loud. When we mentioned we were from Nueva Jersey, one of them pointed to the wall and said, "Oh! New Jersey, my friend, the Boss, el jefe, Bruce Springsteen! Mi amigo mejor!" The bartender showed off all the pictures of the Americans who had visited, including Bruce, Mickey Rourke, and Jimmy Carter. 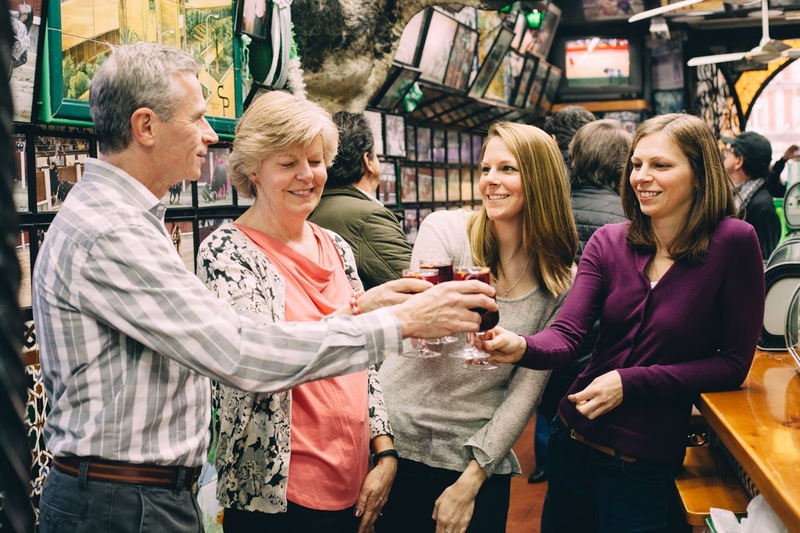 Each time our family went in thereafter, the bartenders would rejoice in waves of "Nueva Jersey!" They told us about *their* Boss, a Spanish artist who is loved like Bruce is loved. They put on his album for us, which sounded *nothing* like Bruce but sounded *everything* like Spain. I told them it sounded el mismo anyway. 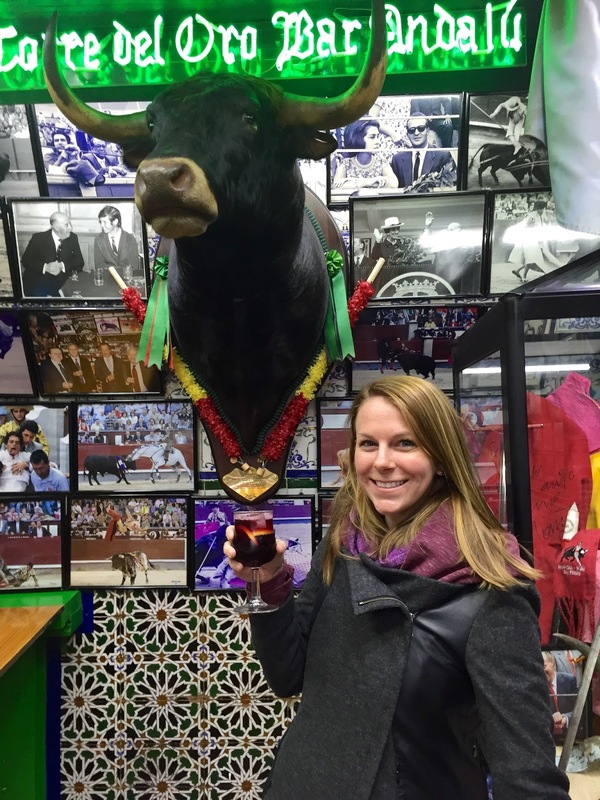 If you're ever in Madrid, please make your way to La Torre del Oro and say hola to my amigos - the bartenders, Bruce Springsteen, and the bulls - though I hope they won't be adding any more bull heads to the walls in the future. Also try the sangria, which is one of the best I've had in Spain, and that's no bull.